Last year I came home from a Halloween party (dressed as Alex Delarge) and curled up on the couch in hopes of catching a scary movie before declaring my Halloween fun over for another year. 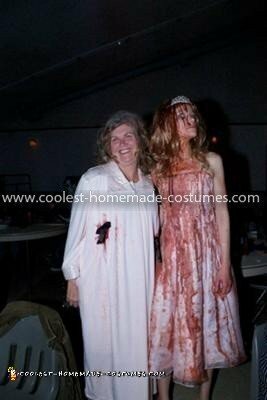 As luck would have it, Carrie was just starting up, and I decided then and there that I had found next year’s costume! 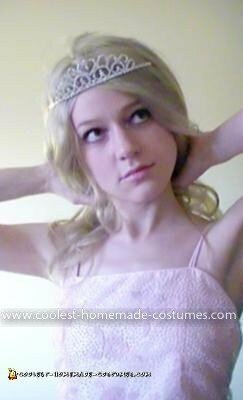 It was actually really easy to put together, requiring only a pink strappy pink prom dress from the thrift store, a long blond wig, some nice formal sandals, a tiara, some nail polish, and of course a HUGE bottle of theatrical blood. A few days ahead of time, I took a picture of myself in the dress, wig, and tiara and posted it to Facebook as a hoax, claiming I was going as a prom queen. Not exactly a lie, right? Immediately after, I hung the dress and wig in my shower stall and poured most of the theatrical blood down the dress and wig, focusing on the right side, as that is where the bucket of blood first strikes her in the film, starting at the top and letting the blood flow down with gravity. I hung it on the clothesline to dry. I wonder what the neighbors must have thought! The blood dried so I could wear the Carrie Costume out without staining everything I touched, but I wanted a fresher glossier look, so I painted some extra gore on with deep blood-red nail polish. When Halloween came, I simply slipped in to my assembled costume and drenched my face and shoulders in the remaining theatrical blood. I chose to wear a tiara despite Sissy Spacek’s having been knocked off in the film, since wearing a tiara seemed to make the difference (to me anyway) between “disgraced prom queen” and “Barbie with a head injury”. A wild-eyed facial expression completed the look. I posted a new improved Halloween costume photo to Facebook and went to a costume party where I won best costume. Best of all though, I was sitting with some friends when I was approached by a man who said to me “You’ve been sitting here two hours, and you haven’t said hello to your mom!” Confused, I turned around only to see a woman I had never met unmistakeably dressed as Piper Laurie’s character in Carrie… a housecoat, slippers, and the knives Carrie used to kill her protruding gorily from several places! “Carrie” is one of my favourite films ever and you are one of my favourite people. Brilliant! I approve of this costume! Future Carrie worshippers will be inspired by these photos. Carrificlly horrific!! You’re awesome and I wish the whole world knew about you! I fell for the hoax :( BUT I enjoyed the final product much more! I want to be Carrie for Halloween and this inspired me to try and make it possible. Being Carrie is now my goal!